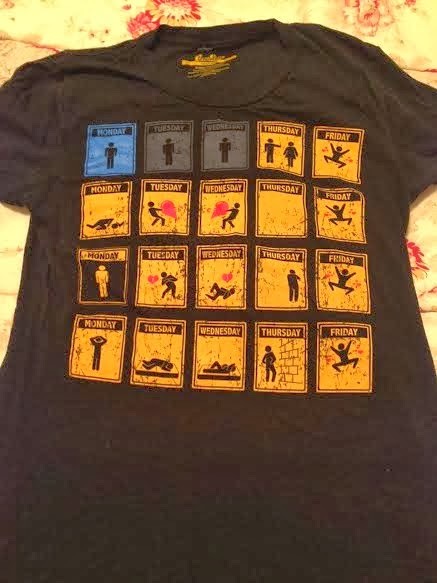 Reader Caitlin #1 sent me a photo of the t-shirt she's wearing this Valentine's Day, and I knew my Wilfair friends would like it as well. Know what it is? Hope you haven't scrolled down too far for the big reveal. You're right! It is a visual tribute to the lyrics of "Friday, I'm in Love" -- you're so smart! And because we welcome happy-makers here, and because The Cure's song is such the happy-maker, let's enjoy it now. I'm breaking a rule here, by the by: I try never to post anything twice, but, yes, I posted this video back in 2012. Because it is eternal and good and right and true. Here's the link to the cute tee, too. Happy Valentine's! That shirt is genius, where did it come from? You can find it at Threadbare, Bess!